As part of their Good Business Journey, Woolworths is proud to support initiatives like Rotary SafeWater. Through partnerships with their customers and organisations like Rotary SafeWater, Woolworths is increasing awareness of the social issues in South Africa, while actively supporting social upliftment projects in South Africa. 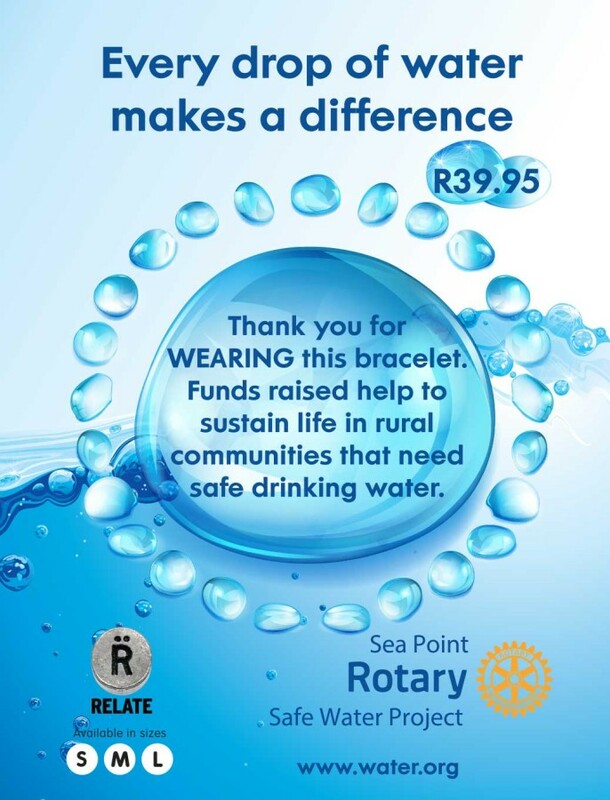 Through the sale of each bracelet, Woolworths donates R10 to Rotary SafeWater. Provision of water and sanitation is one of Rotary International’s key areas of focus. Rotary SafeWater is a project started by the Rotary Club of Sea Point to provide cost-effective filters to impoverished communities with no access to clean and safe water. Worthwhile, easy to use, point-of-use water filters which can last a household or community up to 3 years has impressive impacts on communities. Diarrhoea, particularly in children under 5 can be reduced quite significantly. Diarrhoea kills more children than AIDS, measles and malaria combined. It reduces deforestation. Water does not need to be boiled to be safe to drink, and so less wood is consumed. As less firewood is required and contaminated water closer to home can be collected, children have more time to go to school. The approach taken by Rotary SafeWater depends on the needs of the various communities. In some rural and peri-urban areas, people are already buying expensive bottled water. We are developing a project where entrepreneurs can earn a living by providing clean and safe water. Entrepreneurs will be supplied with a filter and equipment to dispense the clean and safe water into small, plastic sachets, which degrade quite quickly – helping to reduce pollution. Entrepreneurs will be coached to ensure good business and hygienic practices. Financing will be assisted with micro-finance groups. The idea is that cash returns will be used to fund more filters making your donation more effective. We are providing farm schools with filters to help reduce the diarrhoea -induced absenteeism experienced in farm schools where children drink contaminated water. 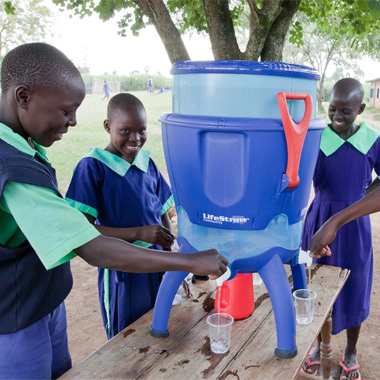 LifeStraw® Community is a high-volume point-of-use water purifier with built-in safe storage that provides safe drinking water for community, educational and institutional settings. It prevents waterborne disease such as diarrhea, typhoid, cholera, worms, and cryptosporidiosis. Please view the LifeStraw® Community Brochure for more information. Initial installations of filters began in June 2013. Funding from this project began in April 2016. It’s a human right to have access to clean and safe water. We are currently working with a number of organisations to help provide clean and safe water. Further income will help us accelerate the installation of appropriate filters into communities. Members of the public can help by buying bracelets. Funds go towards buying more water filters for communities in need of safe drinking water. There are many impoverished communities which we have not identified who would benefit with better access to clean and safe water. Introductions to community leaders or NGOs associated with impoverished communities who can assist with installation, and more importantly assist with ensuring long term correct use of the filters would be greatly appreciated. The project is co-ordinated by Dr Tony Davidson and members of his Rotary Club. Partnerships with other Rotary clubs are in place. Nico Germishuizen from Aqua-4-Life assists in providing the cost-effective filters and collaborating with the communities in which we work. Lauren Gillis and Neil Robinson of Relate Trust provide us with a fund raising mechanism by manufacturing and marketing Rotary SafeWater bracelets. I review each and every community and sign off on the particular needs of that community and order the appropriate filters. I work directly with EIM, an entrepreneurial incubator and pay them for tasks completed to ensure the viability of the entrepreneurial project.